On this date in 1954, Lucretiu Patrascanu was shot in Jilava Prison outside Bucharest. The widow’s-peaked longtime pol was one of the first inductees of the Romanian Communist Party (PCR) after its 1921 founding. Patrascanu (English Wikipedia entry | Romanian) was 21 years old then: the spirited politicking within the Communist movement would define the whole of his adult life. By the 1930s, he held a position of national leadership. Patrascanu served in the Romanian legislature, and became a party representative to the Comintern. It might have been at a Comintern road trip to Moscow in the 1930s that Patrascanu’s disillusionment with Stalin began. If so, it was beside the point: leftists in Romania (like everywhere else) had the more immediate threat of fascism to contend with. 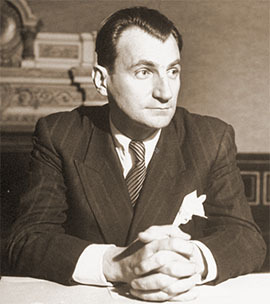 After spending most of the war years under arrest, Patrascanu re-emerged as a state minister. He personally helped to author the August 23, 1944 coup that flipped Romania out of the Axis camp. But by the very next year he was under police surveillance. He fell in the Soviet-driven late 1940s purge of Eastern European Titoists, for having such insufficiently internationalist notions as “before we are Communists, we are Romanians.” His time in prison was long enough for authorities to model his show trial on the 1952 Czechoslovakian Slansky trial, though Patrascanu himself disdained to denounce himself, or even to dignify the proceedings with a defense. I have nothing to say, except [that I] spit on the charges brought against me. He was posthumously rehabilitated in 1968 by Nicolae Ceausescu. * Poignantly, Patrascanu was said to have read Koestler’s dystopian novel of the Soviet purges, Darkness at Noon, while an envoy to the 1946 Paris Peace Conference.